Bitcoin bashers and angry gold bugs have missed the bus and are missing the point. While Bitcoin may be attracting some of the investment dollars that would otherwise be flowing into gold, the two are actually quite complimentary and can co-exist nicely. This article explains why that is the case. So says Jason Hamlin (goldstockbull.com) in edited excerpts from his original article* entitled Bitcoin is Not the Enemy of Gold Investors. They claim it is a Ponzi scheme, but Bitcoin hardly resembles a Ponzi scheme. Bitcoin has no sole authority pulling strings behind the curtain and there is no scam artist promising incredible returns while cooking the books. Bitcoin is open-source, transparent and run by the community that uses it. A Ponzi scheme has a bunch of losers that end up giving all of their money to a single winner. It is a zero sum game in the end. Bitcoin does not require a bunch of losers or a central conman to operate it and Bitcoin is not a company or person benefiting from a zero sum game. Bitcoin is not based on fraudulent claims about its value or the returns it will generate, but voluntary participation in the system. Gold investors and liberty lovers should not hate Bitcoin…After all, it is the people’s money and is used voluntarily, unlike FED notes such as U.S. dollars, which rely on coercion to force acceptance, both domestically and abroad. We witnessed what happens to Middle Eastern leaders that wish to accept payment for oil in something other than dollars or talk of creating a gold-backed currency. 1. they are outside the control of any governments or central banks. The FED and their shareholders are not benefiting from a monopoly on issuance of Bitcoin. Politicians are not getting kickbacks and lucrative jobs at Bitcoin banks after their retirement. Furthermore, the supply of Bitcoin is strictly limited to 21 million, unlike FED notes which can be created literally to infinity via printing presses and strokes on a computer keyboard. The banks can not lend out Bitcoins they do not own and government can not fund wars via printing Bitcoin. 2. they are created at a decreasing and predictable rate. The number of new Bitcoins created each year is automatically halved over time until Bitcoin issuance halts completely with a total of 21 million Bitcoins in existence. There can never be more than 21 million Bitcoin created, so investors need not worry about the type of inflation that has resulted in the U.S. dollar losing over 95% of its value since the Federal Reserve was created in 1913. These are the characteristics that have attracted so many people to precious metals and the flaws that have inspired a growing distrust in central bank fiat money. Before you lump Bitcoin into the fiat money category, consider that it is not created without considerable effort, via government decree or other authoritarian command, as defined by Webster. While it may not have physical form and utility such as those that give precious metals value, Bitcoin certainly has intrinsic value in its ability to quickly and cost-effectively transfer wealth anywhere around the globe in minutes. This is a valuable characteristic that Bitcoin offers over any other form of currency. Try sending $100,000 worth of gold outside of the United States or bringing it with you on a plane. Try wiring money to Europe the same day or without coughing up significant bank fees for them to simply transmit electronic data on your behalf. Bitcoins have value because they are useful as a form of money. Bitcoin has the characteristics of money (durability, portability, fungibility, scarcity, divisibility, and recognizability) based on the properties of mathematics rather than relying on physical properties (like gold and silver) or trust in central authorities (like fiat currencies). As with all currency, Bitcoin’s value comes only and directly from people willing to accept them as payment. Furthermore, gold is not limited in quantity like Bitcoin. New technologies might increase the mining efficiency and supply of gold in the coming years. We could find out that the Earth’s core is filled with gold or nearby planets have massive supplies ripe for the picking once space travel progresses. Unlikely? Maybe, but with Bitcoins the supply mathematics are perfectly predictable. How about the obvious manipulation in the gold and silver markets and control that a few banks and agencies have over price discovery? JP Morgan can’t use paper leveraged trading to artificially manipulate the Bitcoin price like they do with silver. There is no London Bitcoin association that fixes the Bitcoin price twice a day. By contrast, the price of a Bitcoin is determined by free market supply and demand. Also, there are no privileged traders getting important economic data ahead of others, trading on inside information or using high-frequency platforms and co-location to rob from less sophisticated traders. Some of these elements may try to sneak their way into the Bitcoin universe, but for now the playing field is significantly more level and fair than any offering the financial world has put forth. A fast rise in price does not constitute a bubble. An artificial over-valuation that will lead to a sudden downward correction constitutes a bubble. Choices based on individual human action by hundreds of thousands of market participants is the cause for Bitcoin’s price to fluctuate as the market seeks price discovery. The primary factors driving the Bitcoin price higher are increasing awareness and usage, not artificially low interest rates or government policy. There is some irrational exuberance and greed to be sure, but people aren’t falsifying income to banks to get loans or utilizing margin accounts to acquire Bitcoins, as were the causes of previous bubbles. The fact that Bitcoin can operate independent [of] meddlesome governments and banks helps to ensure the price action is market driven and not induced by a small group of people with political power. What if the power grid goes down? Bitcoins can be stored offline on a hard drive, USB stick, CD or DVD. You will need a network to send Bitcoins, but you won’t lose your Bitcoins if the electrical grid goes down or the Internet is turned off temporarily. If the Internet is shut down forever, I suppose you risk your Bitcoin investment, but you will have to decide how big of a risk you ascribe to this possibility. is a currency of free choice, brought about by the free market and absent the necessity of coercion to exist, which are attributes this community should be embracing and supporting. The government may find a way to restrict usage or a better digital currency may rise up to take its place, but Bitcoin is not the enemy of gold investors or libertarians. It is complimentary to precious metals and they each have their respective strengths and weaknesses…These two forms of currency have more similarities than differences and we should be rejoicing in growing adoption of a free market currency not controlled by the big banks or their lapdog politicians. 1. 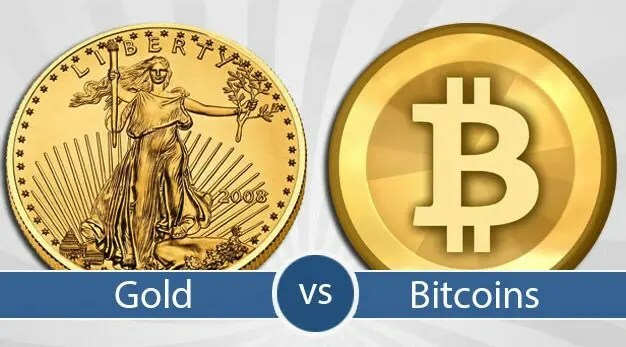 Is Popularity of Bitcoins Adversely Affecting Price of Gold? 3. Bitcoin vs. the U.S. Dollar – No Contest – Ever! 5. Goodbye Euro, Hello Bitcoin? Will Use of New Crypto-currency Spread Across Eurozone? 6. What Are P2P Currencies (Bitcoin & Litecoin)? Should We Get Some?